This one was *really* weird stuff. – “Access denied” message appears! I wandered why a user who has Full Control rights over the site cannot edit a task. The task itself had inherited permissions from the host site, giving johndoe Full Control over itself. Extensive Googling took me to this MSDN Forum post. I tried the suggested solution of publishing the site to a local disk. After this, johndoe can edit the task. It smells like a bug inside SharePoint workflow infrastructure. As I recently reinstalled Vista (as I explained in my previous post), all the drivers for my Vaio laptop had to be reinstalled too. It all went well, except for the sound card. It’s a Sigmatel card (High Definition Audio Device). 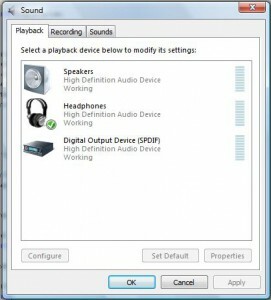 The problem was that the sound output was OK, except when the headphones were plugged in. 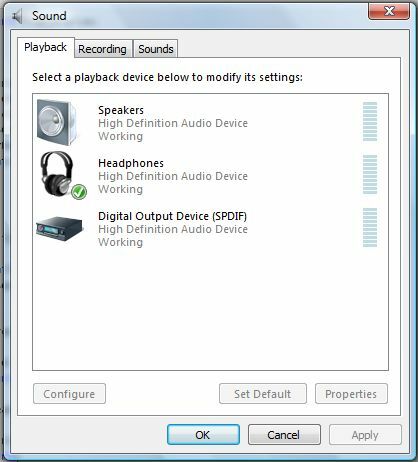 In that case no sound was heard, neither from the speakers nor from the headphones. First I thought that my proxy or firewall settings were wrong. However, the reason for this error is that Vista volume license images ship with a generic Product Key. You have to change this product key to match your company’s MAK (Multiple Activation Key). I changed it and Vista activation was a breeze. If only Microsoft would change the nondescript error message with something like “Your Product Key has not been set. Please enter your Volume MAK key“. Maybe in SP1? Today I was setting up a fresh virtual machine with MOSS 2007 and I met the dreaded “An unknown error has ocurred” message after the SharePoint Configuration Wizard finished. to the user NT AUTHORITYNETWORK SERVICE SID (S-1-5-20). This security permission can be modified using the Component Services administrative tool. I looked up in the Registry and found out that the CLSID in the message identified one “IIS WAMREG admin service”. Then, I opened the Component Services, DCOM Config and under the properties of WAMREG service component I allowed NETWORK SERVICE account local launch and local activation permissions (on the Security tab). The MOSS 2007 fresh welcome was just one IISRESET away! Usual suspect: the class name and assembly reference do not match in ACTIONS file and DLL. Please check that your class reference in the Action tag in the ACTIONS file exactly matches your DLL full name. Not so usual suspect: SPD has a cached reference of your old DLL. Exit SPD, delete ApplicationDataMicrosoftWebSite Cache folder and restart SPD. Even less usual suspect: You’ve correctly placed the ACTIONS file and the activity DLL, but you haven’t added an authorizedType element into your web application web.config file. Add the correct entry (you can check the whole process here) and try again. Usual suspect: the demoted property name in your DLL and in ACTIONS file do not match. Please check that all your properties in the code exactly match the Parameters section elements in your ACTIONS file. I hope that these simple advices save you valuable time. Happy programming in the WF world!